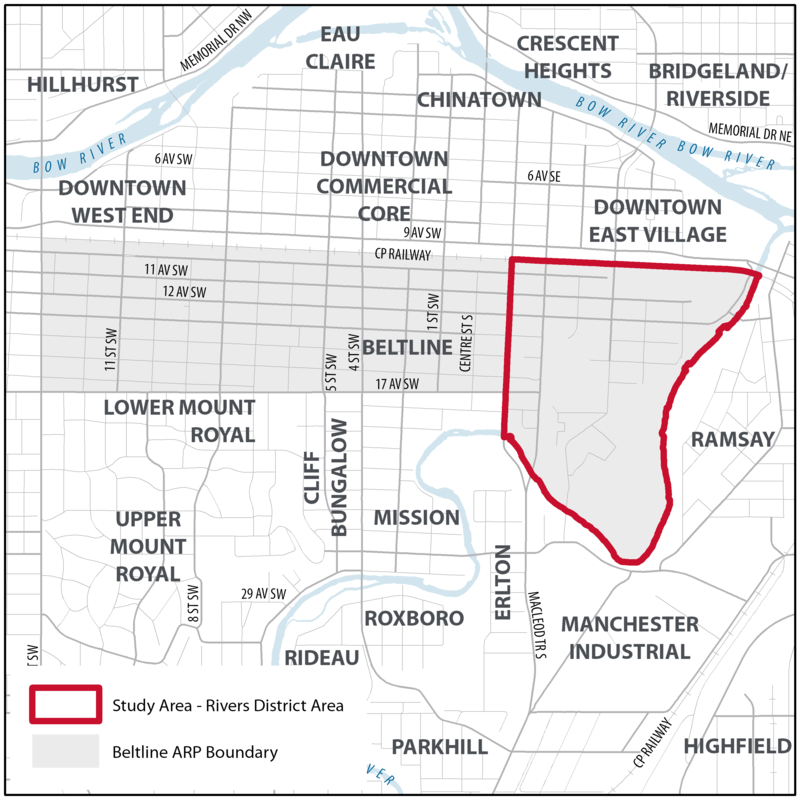 The City of Calgary is starting the process of amending the Beltline Area Redevelopment Plan (ARP) to create policies that will guide future development of the Rivers District area – a 286 acre portion of land in downtown Calgary’s east end (which includes east Victoria Park). The Beltline ARP was adopted by City Council on May 15, 2006. Over the last 12 years, the area has experienced significant growth, transforming into a vibrant diverse community. A number of projects are contributing to the need for ARP amendments, including a new Rivers District Master Plan being created by Calgary Municipal Land Corporation (CMLC), the 17 Avenue S.W. extension project and the arrival of the Green Line. This area is envisioned to become the cultural and entertainment district of Calgary. The goal of the Beltline ARP amendments are to realize the vision described by CMLC’s Rivers District Master Plan, and to put in place the policies and framework to help guide the development of this cultural and entertainment district. An Area Redevelopment Plan (ARP) is a long-range planning document that is developed collaboratively between City staff and stakeholders. A statutory plan which is approved by City Council, an ARP outlines a vision and policy for a specific community, and provides alignment with regulations set out in the Municipal Government Act. An ARP also directs the redevelopment, preservation or rehabilitation of existing lands and buildings, generally within developed areas of the city. What is the Rivers District Master Plan? In 2017, CMLC embarked on a master plan process to create a cohesive, forward-thinking vision for what is envisioned as Calgary’s cultural and entertainment district. Ultimately, CMLC imagines the district as a vibrant, high-density, mixed-use community that will see more than 8,000 new residents move into the community and approximately four million square feet of development over the next 20 years. The master plan vision respects the beauty of the Rivers Districts natural surroundings, its cultural heritage and the spirit of entertainment that is active in the area today. The master plan seeks to integrate the existing urban fabric, including several historic buildings, Stampede Park and the Elbow River, and reshape the community into an active, walkable, accessible community with enhanced connections. The Rivers District Master Plan will guide and accommodate a variety of entertainment and cultural amenities. This project will focus on the area highlighted in red, or the Rivers District area (which includes east Victoria Park). It is bounded by the CP railway tracks to the north, 1 Street S.E. to the west and the Elbow River to the east and south. Part 2 is the plan for the culture and entertainment district. This plan provides policy to support a mixed-use high density community, with a variety of arts and cultural amenities, performance spaces, expanded conference centre, and events centre. To support the implementation of the ARP amendments, land use bylaw amendments are proposed to align the densities in the Centre City Mixed Use District (CC-X) and the Rules Governing Centre City Bonus Overlays with the Land Use Concept and Density Areas Maps in the Area Redevelopment Plan. The land use bylaw amendments provide for a density bonus system that focuses on providing new arts and cultural amenities in the area, as well as incentives for connecting to the district energy system. The engagement program for the Beltline ARP amendments project is now complete. City has collected feedback from citizens about Calgary’s future cultural and entertainment district and draft concepts for the amended Area Redevelopment Plan. In our first phase of engagement this past Spring we engaged with citizens to learn about their vision for the future of this area. In phase two we were seeking your feedback into draft proposed concepts for the area. To review findings from our engagement program, please review these reports. Findings from the public engagement program have been included in the reports to Calgary Planning Commission, Committee and Council. After reviewing the information panels shared above, please provide your answers below. Based on the vision shared for East Victoria Park, do you feel there is anything missing from the proposed plan ideas shown here today, to help make this vision achievable? Based on the road network shown in the information panels provided, which connections would you use in this area? What do you think is important for The City to consider when illuminated buildings are proposed in East Victoria Park? Think about how you currently use transit to access the area. Do the new proposed connections shown in the information panels, improve your ability to get to and through the area? The proposed plan outlines a number of new open spaces, parks and plazas. What does The City need to consider in the development and amenities available for these new spaces? Is there anything you want to share with The City about the proposed plan ideas shared here, or anything you feel is missing from the plan? 1. What are the first three digits of your postal code? This question is optional and the information is being collected to ensure we are reaching Calgarians city-wide. 2. How did you hear about this project? 3. When did you last visit east Victoria Park? 4. Why did you visit east Victoria Park? 5. How did you get to the area the last time you visited? 6. Are there any barriers/ challenges that currently exist and prevent you from enjoying the area? 7. In your opinion what does a world-class cultural and entertainment district offer? 8. What attributes would make the Rivers District a great neighbourhood to live in? 10. Based on the images/icons below, what development styles would you consider appropriate for this area? The Rivers District Master Plan is a twenty year vision that imagines east Victoria Park as a mixed-use cultural and entertainment district that is inspired by its entertainment DNA. The master plan seeks to create a cohesive vision for the community that will balance new residential development offerings for some 8000 new residents, over 4 million square feet mixed-use development, vibrant walkable streets and establishing critical connectors in and out of the district. 11. Based on the vision above what experiences are most important to you? 12. Based on the vision above what experiences are least important to you? 13. Are there any other issues or opportunities that you would like The City and CMLC to consider as we plan for the area? 16. What worked for you about the feedback opportunities provided to you? Is there anything we could do differently to make it better? All engagement results collected through our engagement program will be provided to Calgary Planning Commission, Committee and City Council prior to final decisions being made. This isn’t the final decision for the plan. You can still get involved by submitting your written comments to City Administration or members of Council, and by attending the Public Hearing of Council. The public hearing will be held on April 29, 2019. To watch the Public Hearing of Council online, click here. To learn more about how to attend and present to Council, click here. For updates subscribe to the Beltline ARP email list.